Alisa Krasnostein and Julia Rios (edd. ), Kaleidoscope: Diverse YA science fiction and fantasy stories. Twelfth Planet Press, 2014. Pp. 439. ISBN 978-1-9221011-1-2. $16.99. Kaleidoscope is an anthology of short fiction, published by Twelfth Planet Press, and crowdfunded via the Pozible platform, that collects together twenty stories of “diverse young adult science fiction and fantasy.” One might wish that a theme as broad as “diversity” would be a sine qua non in any work of this size, that twenty short stories around topics of family, coming-of-age and socialization, would be bound to include many examples of protagonists and other characters who are not straight, cis, abled, white, Anglo etc. ; as with speculative fiction on the whole, though, we know this just ain’t so. Reading this anthology it becomes clear how unusual it is to really focus on the diverse, on the marginalized, on all the inhabitants of our world, not just the popular and preppy ones. In very few of the stories do we feel that diverse characters or issues have been shoe-horned in—they are there just as they are there in our lives; the stories are about them because they are their stories. There is nothing “worthy” or “dry” or less than entertaining about these tales. They are as suitable for young adults and fans of speculative fiction alike as any other collection of stories. If the word “diverse” weren’t in the title, I wonder how would even notice, except for a sense that this anthology presents a world a little more complete than most. With perhaps roughly equal clusters of stories around themes such as disability/mental illness, race/immigration and queer/trans characters, it’s striking how few stories treat only a single issue. Again, as in life. It is a testament both to the quality of the writers and the imagination of the editors that such variety is found here, so many new approaches to themes, styles and characters, but with such a consistency of quality and clear unity of purpose. There are one or two rather silly pieces in here (but again my own prejudices as a reader may be spoiling them for me, so I shan’t single them out); on the whole this volume is among the most exciting anthologies I’ve read in years. I was at first a little resistant to the first story in this volume, since neither superheroes nor high school narratives are much to my taste (avoiding high schools in a volume of YA would be a tall order, I hear you sneering already). But Tansy Rayner Roberts’ “Cookie Cutter Superhero” is a beautiful story of a girl facing off against glitz, paparazzi, curious and insensitive schoolmates and her worried, protective friends as she becomes the next in a stream of machine-stamped superheroes. Both colleagues and the press are also obsessed with Joel’s “disability” (although she sees herself as having an extra curve, not a missing hand), even though neither before nor after receiving superhero powers is she hindered in any way outside of other people’s perceptions of her. The story also addresses issues of gender, including creepy and abusive men, and the need to carry on functioning while in the public eye in a society as absurdly commercialized as our own. I hesitate to use the word “inspiring” because it is often employed in the most patronizing of ways to describe people with disabilities as “brave”, “overcoming” and as if they only existed to serve as an example of perseverance and hard work to the abled, but I read this story when working on plans for a volume of disability-themed SFF, and it opened my eyes to some of the possibilities for the theme, for which I’m grateful. Another great story including a character with disability is “Signature” by Faith Mudge, the protagonist of which, Priya, uses a wheelchair and works in a bookstore café. 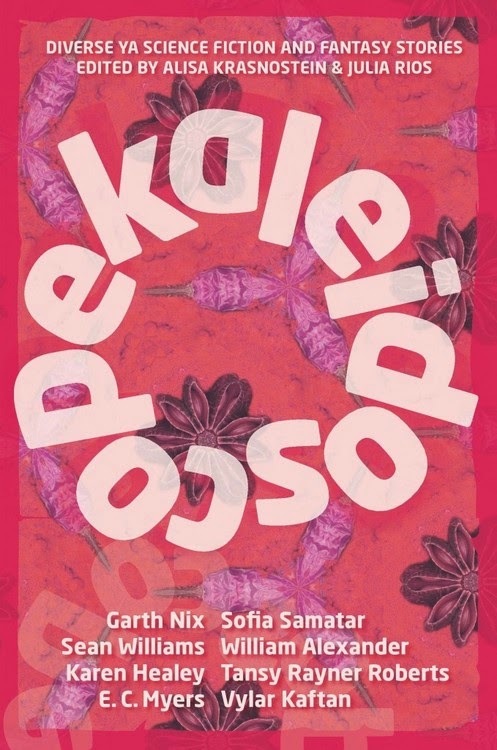 This is neither a story about disability, nor the queerness of lesbian and gay background characters, nor Priya’s race, but primarily about exploitation, fear, the cruelty and injustice of Fate. Our geeky, bibliophile heroes are up against “real” dangers and challenges, which they will only be able to overcome if they can stand together, if they can celebrate their strengths, which are to defend the value of art and literature, the intangible truths of love and trust. All of which sounds very clichéd when I say it like this, but they are the same truths the drive any story, and my point is the fact that this story is “diverse” makes it no different, no less strong, no less lovely a read. Perhaps the most beautiful story in this volume, and surely a 2015 award contender if ever I read one, is Amal El-Mohtar’s “The Truth About Owls”, about a young girl alienated from the culture of her Lebanese immigrant parents. Anisa has a destructive power in her hands that she needs to learn both to hide and to control, and it is when she visits an owl sanctuary near Glasgow that her obsession with owls, and with the Welsh language, begins. In a wonderful, seemingly effortless coming-together, this story ties into the love of owls Anisa’s developing peace with herself, her powers, her family and the world she lives in. This may be the most effective evocation of childhood personality and growth that I’ve read in a speculative fiction story. “The Lovely Duckling” by Tim Susman is another superpowers story, this one a transgender allegory about a child with an affinity for taking the form of a condor, in a society where conservative elements (including Mara’s overbearing, controlling father) disapprove of and discriminate against shapeshifters in the midst. I shan’t give too much away, since this story is told in epistolary format (through emails and telephone transcripts with a shifter school) and so we see multiple points of view, although always sympathize with Mara, of course. As it announces itself in its opening words, Alena McNamara’s “The Day the God Died” is a story that is not a story, but rather the memory of a trans child in the last years of high school, who meets a dying god shaped like a huge predatory beast on a deserted coastline. In awkward conversation, the child reveals a conflict between love of theater and desire to do well at biology in order to go away to college; between being true to one’s nature and fitting in enough to survive. Despite its disclaimers to the contrary, this moving and lovely story does have an arc, character development, beginning, middle and end, and was one of those that stayed with me the longest after reading it. There are a few stories that use the metaphor of the monstrous to address the perennial issue of children who don’t fit in. Among them “Vanilla” by Dirk Flinthart, in which a second-generation Somali immigrant in Australia befriends a group of alien refugees (pretty obviously based on terrestrial dogs) that everyone else in her school barely tolerates. In a very different vein, Sofia Samatar’s haunting “Walkdog” is a quiet girl’s report on a local legend, and the obsession of the unpopular, geeky boy she is gradually becoming very close to. Both stories are told in the medium of the child’s own words addressed to a teacher. On the theme of characters with traits normally identified by society as disabilities, “Chupacabra’s Song” by Jim C. Hines features a girl who seems to be autistic, and also a musical spellcaster (this is in a world in which magicians are not uncommon, so she is not a clichéd “magical disabled character”), who tries to protect the magical creatures who find their way into her father’s veterinary surgery. Vylar Kaftan’s “Ordinary Things” takes a less fantastic approach to a neurodiverse character; Katie exhibits behaviors I would identify as OCD, but to her they are the rituals that keep her safe in a hostile world. Neither story romanticizes or makes the characters’ diversity inspirational, but nor are they objects of sympathy or pity; they live their lives, if only society allows them to. I will end by highlighting two of the most overtly intersectional stories in the anthology, which include “Welcome” by William Alexander, a story that features a protagonist in chronic pain, and also an exile/immigrant, Latino working as a smuggler between worlds. E.C. Myers’s “Kiss and Kiss and Kiss and Tell” has a familiar premise: a drug allows teenagers to look into the future and see the outcome of a relationship they are considering: the protagonist is being treated for mental illness, and is bisexual; another major character uses a wheelchair. As always, there is no sense that these features are being piled on: they are just characters living in the world. Diversity is the norm. Throughout this review I have stressed (Nay, labored! I hear you complain) the fact that diversity does not mean stories are only about these issues, that political stories are not boring or heavy-handed, and that inclusiveness necessarily acts upon multiple intersecting axes of under-representation and oppression. I have done this not only because these are truisms for any who publish in this area, but to highlight the huge success of this volume in achieving all of these goals. Whatever their other faults, none of the stories herein are boring; none are single-issue stories; none let the politics get in the way of storytelling. The fact that editors and publishers spend so much time arguing that diverse fiction can be—I would argue, are even more likely to be—good stories on any terms, is a clear sign that we recognize it is not always the case. Krasnostein and Rios are therefore to be applauded for crafting an anthology that is not only very worthy, but stands the test of being joyful to read by any standards. Edited to correct an error of fact in the discussion of Amal El-Mohtar's story.